Why can’t victims of communism just “get over themselves”? Cubans live in a place where the government will shoot at you if you try to leave. Ponder that for a moment, because Grantland.com’s Charles P. Pierce never stops to. His latest screed addresses the fiasco surrounding Miami Marlins manager Ozzie Guillen’s recent comments on Fidel Castro. Pierce approaches the topic with a sadly familiar nonchalance about the horrors of the Cuban regime. Not entirely surprising that a man arrogant enough to title a book Idiot America: How Stupidity Became a Virtue in the Land of the Free would be lacking in perspective. So, I thought, let’s let some big American firm build us a stadium along the waterfront and let the old man name it: Venceremos Stadium or something. Give it five years, and it’d be Minute Maid Venceremos Stadium. Guaranteed. I would also stipulate that the entire right-field bleacher section would be sold cheaply to families with children. I figured 50 cents a head would be about right. Setting aside the comedy of Pierce assuming he is clever and magnanimous for coming up with the idea of price-fixing in a communist country, I’m not so sure these poor Cuban families would be quite as excited to have an eye-line view of a luxury box occupied by the man denying them freedom… while sitting in a stadium likely named after him. Give my team in Havana five years, I thought, and Communism would fall to the implacable forces of well-financed fun, just the way it has in so many other places. Other places like… China? Their expanded economic freedom has led to improved circumstances for many, but it is still a police state, with a Gulag, and with some dissidents so desperate they’ve resorted to lighting themselves on fire in protest. A few extra bucks is nice, but doesn’t necessarily buy a ticket to freedom. Ozzie Guillen, the manager of the Miami Marlins, was quoted by Time magazine as saying, “I love Fidel Castro … I respect Fidel Castro. You know why? A lot of people have wanted to kill Fidel Castro for the last sixty years, but that (expletive) is still here”…And, for what? For saying something stupid (Castro is not lovable), something more than marginally self-destructive (dude, know your audience), and something that was absolutely true. People have been trying to kill Castro for 60 years, and most of those people were Americans. “Stupid” and “self-destructive”, yes, but he leaves out morally insidious. Castro is a monster who has caused untold pain and suffering. Any praise for such a ruthless tyrant is a jarring insult to those forced to risk their lives by makeshift rafting across 100 miles of open ocean to flee his oppression. And why the odd aside on Castro’s attempted assassins being Americans, as if to imply a moral equivalence or create the impression of a persecuted victim? As tired of the Ladies in White, or Oscar Biscet? Doubtful. For going on 60 years now, the foreign policy of my country — and a good bit of its domestic politics as well — has been held hostage by a band of noisy irreconcilables in South Florida. The first generation of émigrés are strong and they are politically active, and nobody ever says no to them, and it’s past time for them to get over themselves, a feeling that more than one survey has noted is shared by the grandchildren — and now great-grandchildren — of the original émigrés. This country doesn’t owe them or their tender feelings anything anymore. Surveys show grandkids think they know better, huh? Should we base all foreign policy on the worldly perspective of grandchildren? And yet we can’t come to grips with a sensible policy for one small island in the Caribbean because a bunch of old men in Florida are carrying a grudge against one old man who refuses against all odds to die? Instead, we listen to the loud voices of a reactionary past, the ones that demand the occasional ritual sacrifice to atone for someone else’s crimes, and the loud calls for history itself to apologize, over and over again. We live in a country where congressmen and celebrities are less subtle than Pierce’s implicit acceptance of the Castro regime. Cuban refugees are not “old men” who stubbornly refuse to put aside a “grudge”, as Pierce would have us believe. They are uncomfortable reminders who refuse to let communist sympathizers forget the human pain of totalitarian regimes. There is nothing for them to “get over”, as Cuban communism is alive and depressingly well. A man named Wilman Villar Mendoza has died in Cuba. He was a prisoner of conscience, and he died after a 50-day hunger strike. I have written about hunger strikes, particularly those undertaken in Cuba, in great detail. I won’t go into the Mendoza case now. 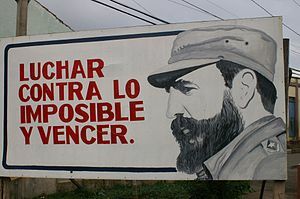 Suffice it to say that Cuban democrats often feel they have no recourse, no choice. Mendoza’s wife, or widow, Maritza Pelegrino Cabrales, is a member of the Ladies in White. This is the group composed of wives and other relatives of political prisoners. They have endured terrible things (although not as terrible as their men). According to a Cuban-American activist of my acquaintance, the authorities are threatening to take away the widow’s two daughters, ages five and seven, if she continues her membership in the Ladies in White. So, she is facing that, as well as the miserable death of her husband (age 31, by the way). This entry was posted in Daily Breakdown and tagged charles p. pierce, cuba, Fidel Castro, grantland, media bias, Miami Marlins, Ozzie Guillén by frack. Bookmark the permalink. Wow, for real? This is a post on the internet? Here’s what I don’t like – my government telling me where I can spend my money. Believe it or not, it isn’t illegal for me as a US citizen to travel to countries like North Korea or Myanmar. 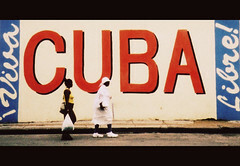 But when it comes to Cuba? You guessed it, I need special dispensation from the Feds, all because of a small bloc of voters. Disgusting.